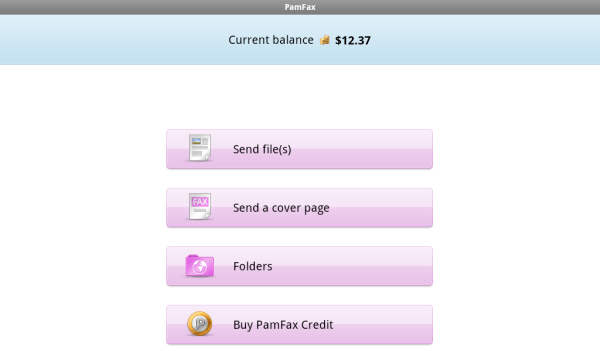 Yesterday PamFax, the obligation-free worldwide Internet-based fax-on-demand service, became available on the BlackBerry PlayBook App World. 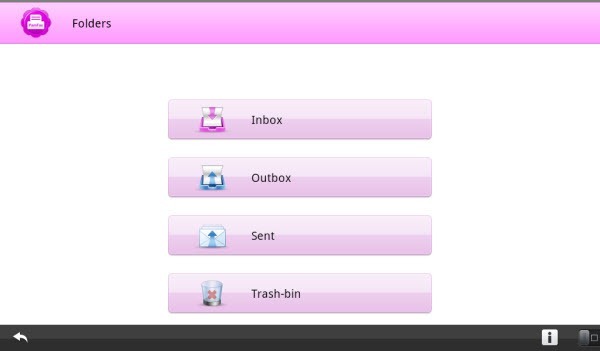 As a result a PlayBook can now become your “fax machine” for sending documents from, and receiving documents on, the device. Files sent include documents on the PlayBook, including those from the photo Gallery or either of the PlayBook cameras, as well as from online file storage services such as DropBox, SkyDrive, Google Docs and BoxNet. 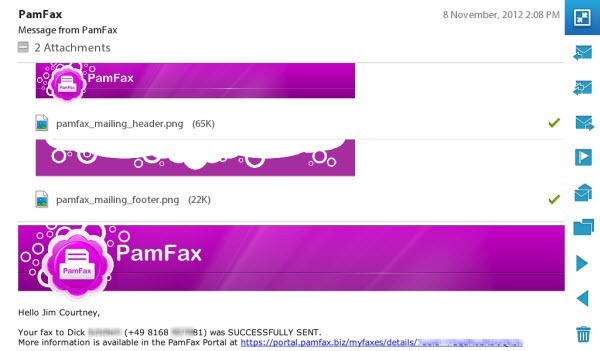 Faxes can be received, via a PamFax number, in a DropBox folder. Scanning of documents still requires a PC with a scanner but they can be scanned into an Online folder. You then go on to insert the fax destination information: Name and fax number, and then proceed to add a cover page (optional) and send the fax provided you have appropriate PamFax credits. All your PamFax activity is tracked on your PamFax Portal accessed via a web browser. 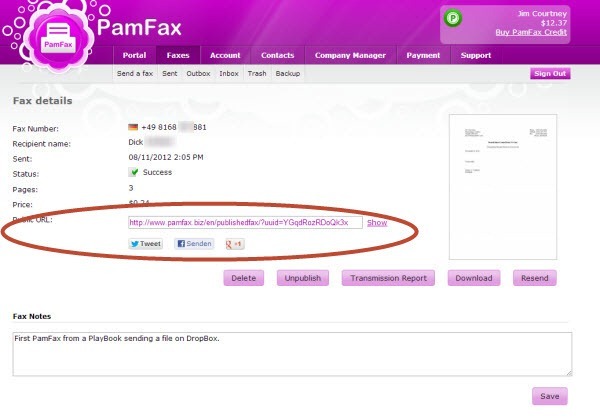 You can also use the portal to manage PamFax activity across a company. Confirmation of a sent fax goes to email, SMS and, optionally, Skype Chat. Beyond the availability of the application on BlackBerry PlayBook the other story is how easily PamFax became available on the PlayBook. A few weeks ago Scendix upgraded PamFax for Android to fully support tablet display sizes, including Amazon Fire series. Once that was confirmed as working on Android tablets they simply converted the final Android .apk file to a PlayBook-compatible .bar file and submitted it for publishing to BlackBerry App World without any modifications required on the part of Scendix. Kudos go to RIM’s BlackBerry evangelist Luca Filigheddu who not only assisted with the conversion but also confirmed that it already works on a BlackBerry 10 Dev Alpha device. PamFax runs in the PlayBook Android player; with PlayBook OS 2.1 individual Android apps, such as WordPress, can run as separate processes on the PlayBook. While PamFax is an obligation-free fax-on-demand service, subscriptions for a fax number in 32 countries and volume discount packages can be found at the PamFax website. Rates usually start at $0.08 per page but can vary by destination country. To try it out, sign up and send your first three faxes free. Bottom line: PamFax is an ideal example of a cloud-based service accessible from a wide range of platforms making use of social networking tools. And it makes faxing a low cost, worldwide, on-demand process in five or six easy steps. 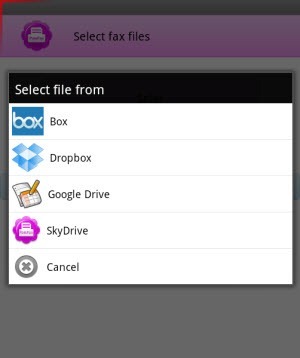 All my fax activities are now accessible on a cloud-based storage service. Full disclosure: while I have been an occasional beta tester of PamFax since its launch, the only compensation comes through affiliate links, such as in this post. The real bottom line has been the elimination of a Bell Canada fax line and low costs for fax transmissions anywhere worldwide, based only on usage.